With its newly released full trailer, Moron 5.2: The Transformation is expected to surpass the fun and comedy of Moron 5 shown in 2012. Directed by Wenn Deramas, the five good looking bachelors came back to make sure that everybody would get out of the theater feeling that they had laughed their lungs out. Together with the five ‘Morons’ is John ‘Sweet’ Lapus who plays as Beckie who hated them beyond the limits of hatred. 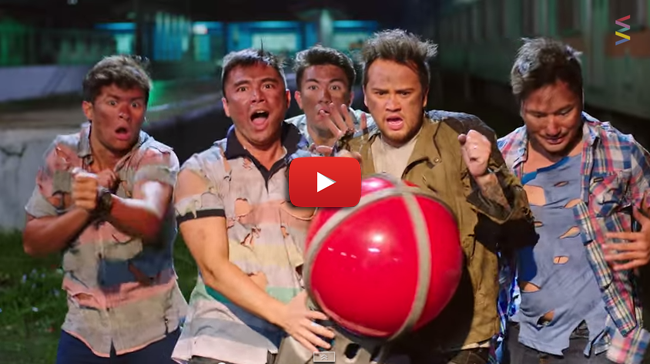 Luis Manzano, Billy Crawford, Marvin Agustin and DJ Durano is joined by Matteo Guidicelli to double the fun. The friends came back on big screen and this time, they have their own families though their children seemed to be embarrassed to be their kids due to their stupidity. Full of remorse that their kids denied them, they accepted the fact that they are indeed mentally slow and which even drove them to find a way to be so their family would be proud of them. The plot revolves around them having gained superpowers from what seemed to be a giant red lightbulb which turned out to be extra-terrestrial orb. They decided to form a superhero group called ‘Moron 5’ dedicated to help people in need around Manila. Meanwhile Beckie had grown more bitter against them and got more dedicated in destroying them since they are the once who ruined his life. He is focused on getting powers like the ‘Moron 5’ and destroy them once and for all. Sweet Lapus had perfectly complemented the men in the movie making it one of a kind. The cast also expressed that they had been close with each other, and the making of the film had been light and easy as if they are just playing around. Produced by Viva Films, the movie is set to open in cinemas on November 5 nationwide.